Can you withdraw your original contributions without penalty? And are there any exceptions to paying taxes and/or penalties on early withdrawals? It's important to know before you make any withdrawals from your account, because some withdrawals trigger taxes and/or penalties. Unlike most tax-advantaged retirement accounts, you can make tax-free, penalty-free withdrawals prior to retirement age. Under IRS guidelines, you can withdraw an amount equal to or less than your original after-tax contributions at any age and under any circumstance without triggering income taxes or early withdrawal penalties. For instance, let's say you're 37 years old. You open a Roth IRA account and fund it with $5,000 in Year 1. In Year 2, you contribute an additional $5,000. By Year 3, your account is worth $11,000. But rather than making another annual $5,000 contribution, you decide that due to an emergency, you need to withdraw $5,000. In such a scenario, you can withdraw the $5,000 tax and penalty-free even though you're under age 59 ½ and your account hasn't met the 5 year rule. Because you made your contributions with after-tax dollars, you've already paid taxes on your contributions. In fact, in the aforementioned scenario, you can withdraw up to $10,000 tax-free and penalty-free. But the additional $1,000 in that $11,000 account? It's subject to income taxes as well as a 10% early withdrawal penalty if withdrawn. Even if you're well past age 59 ½, it's not a safe to assume that all of your Roth IRA withdrawals are tax-free and penalty-free. According to the Roth IRA withdrawal rules, you also need to meet the requirements of the Roth IRA 5 year waiting period as well. This is generally known as the 5 year rule. Under the provisions of the 5 year rule, you first need to open and fund your Roth IRA, a step which starts a ticking clock. Five tax years later (assuming you're age 59 ½ or older), you'll able to withdraw all funds from your Roth without incurring taxes or penalties. For example, let's say you open and fund a Roth IRA in 2012 at the age of 58. In 2015, you're 61 years old, and you decide to withdraw some of the investment gains from your Roth IRA. Can you do so tax-free and penalty-free? Although at age 61 you're older than the minimum withdrawal age of 59 ½, you still haven't met the requirements of the 5 year rule. Remember, five tax years must pass before you can take a qualified distribution. In this case, the clock started in 2012 - the tax year in which you opened and funded your Roth IRA. That starts a countdown. 2012... 2013... 2014... 2015... 2016. 2016 is the fifth tax year, so starting in 2017, all your withdrawals are tax-free and penalty-free under the Roth IRA withdrawal rules. Under the Roth IRA withdrawal rules, you can withdraw your original after-tax contributions without having to worry about taxes or early withdrawal penalties. But what if those contributions generated interest or capital gains? After all, that is the whole of a tax-advantaged retirement account, right? If you don't meet the 5 year rule and age requirements, then withdrawal of investment gains is most likely going to trigger an income tax liability and a 10% early withdrawal penalty. For instance, let's say you're 28 years old. A year ago, you put $4,000 in your Roth IRA, and this year it's worth $5,000. If you want to withdraw $4,000, you can do so without taxes or penalties, since it's equal to your original contribution amount. But if you wish to withdraw the full $5,000, then the $1,000 investment gain is subject to income taxes and the 10% early withdrawal penalty, leaving you with only a fraction of your overall investment gain. Generally speaking, the Roth IRA withdrawal rules require you to reach age 59 ½ before you're eligible to withdraw investment gains tax-free and penalty-free. Of course, this assumes you've also met the requirements of the 5 year rule. Let's say you're 55 years old. You opened and funded your Roth IRA at age 45, so you met the requirements of the 5 year rule long ago. Nevertheless, since you haven't yet reached age 59 ½, any withdrawals of your investment gains are subject to both income taxes at your current income tax rate as well as a 10% early withdrawal penalty. After age 59 ½, it's not so cut and dry. If you're age 59 ½ or older, and you've met the 5 year requirements for your account, then you're home free! Under the Roth IRA withdrawal rules, all withdrawals from your Roth IRA are tax-free and penalty-free for the rest of your life (assuming you don't perform any Roth IRA conversions). Then any withdrawal of your Roth IRA investment gains will trigger both income taxes and a 10% early withdrawal penalty. Unfortunately, even though you're older than age 59 ½, you aren't completely home free until you meet the requirements of the 5 year rule. Also, make sure you keep in mind that any Roth IRA conversions are independently subject to the 5 year rule, so it's possible to fund a Roth IRA for ten years and still have a portion of your funds not meet the requirements for tax-free, penalty-free withdrawal. If this describes your situation, make sure you consult with an experienced financial planner before making withdrawals. This is to your advantage, since you must withdraw all principal contributions before anything else. Since principal contributions are withdrawn tax-free and penalty-free, you won't owe anything (regardless of age or 5 year rule status) until you totally withdraw all of your original contributions. Of course, when it comes to the Roth IRA withdrawal rules, you can be certain of one thing - there are always exceptions. 1) You die and your beneficiary closes the account. 2) You become disabled according to the definition in IRS Code Section 72(m)(7) and IRS Publication 590. 3) You receive a series of "substantially equal periodic payments" based on your current life expectancy. 4) You use the withdrawn funds to pay qualified higher education expenses for either yourself and/or eligible family members. 5) You use the withdrawn funds to pay for the cost of purchasing a first home (limited to $10,000). 6) You use the withdrawn funds to pay for unreimbursed medical expenses which exceed 7 1/2% of your Adjusted Gross Income (AGI). 7) You use the withdrawn funds to pay for medical insurance premiums after receiving unemployment benefits for more than 12 weeks. 8) You use the withdrawn funds to pay back taxes due to an IRS levy placed against you. 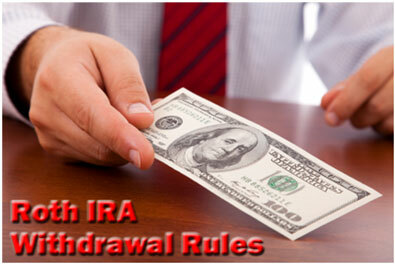 However, these are rare exceptions to the basic Roth IRA withdrawal rules. Always consult a qualified financial professional before attempting to take advantage of any one of these exceptions.